Students of the relationship between business and society will, of late, have encountered a new discourse, that around “corporate welfare”. So what is “corporate welfare”? (my emphasis). So corporate welfare is where the state acts such that the risks attached to generating private profit are shared by us all. But dig a little deeper: let’s try to understand the concept by its composition. 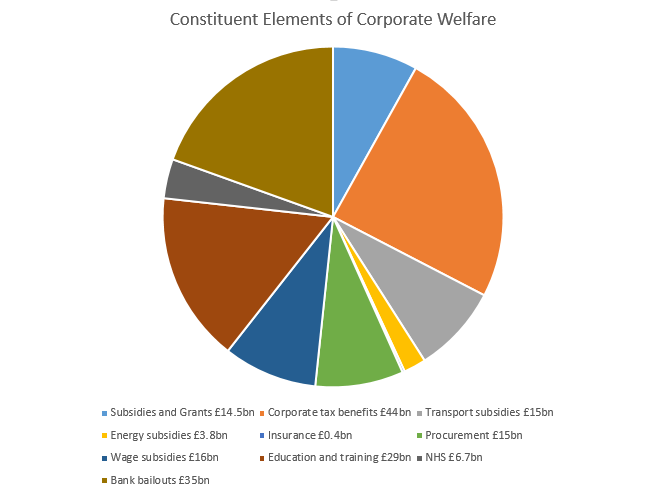 Corporate welfare, the report tells us, costs “between £93bn and £180bn a year”: £93bn represents the “most direct category of corporate welfare”; £180bn includes the education and public health care that delivers indirect benefits to business through an educated workforce not stricken with illness. This is how the £180bn is made up. I don’t want to set out a full analysis of those categories. So let me just make a few points about some of the bigger items. The biggest, at £44bn, is “Corporate tax benefits” and, of these, the biggest is capital allowances (at £20bn pa). But capital allowances are the statutory equivalent of depreciation. They do no more than recognise that, in order to make profits (on which they pay tax), many businesses have to buy equipment (or “capital”) which then wears out and needs replacement. The report, quite wrongly, says that capital allowances “socialise the risks associated with private business investment.” It misses that capital allowances operate to reduce the tax paid on profits – the profits the business owner has to buy the capital assets to make – and if the business doesn’t make profits the cost of buying those assets stays with the business owner. Nor do they “subsidise the production of private profits” (to borrow from the definition). Rather they recognise that in earning those profits the business owner incurs costs. Of “direct” corporate welfare, numbers two and three by size are “subsidies and grants” and “procurement”. Subsidies and grants are support given by Government to business to influence levels of production, prices and suchlike. They include subsidies to bus and train operators to run services at particular levels of frequency and at particular price points. They include payments made under the Common Agricultural policy (the objectives of which can be seen at Article 39 here). They include regional aid to encourage business to invest in economically neglected regions. SPERI describes these payments as “unrequited” transfers but if, by this word, the implication is that Government is not delivering its perception of the public interest through them, it is wrong. There is, of course, scope for arguing that its perception of the public interest is flawed. But that argument is not advanced by badging these payments as “corporate welfare” or “unrequited”. To make that argument requires engagement with the different policy agendas advanced – and the extent to which the money buys value enhancements to those agendas. The procurement figure of £15bn is arrived at by applying to aggregate Government spending on private sector procurement – including social care, defence, construction and so on – a rate of “average profits of 6.5% per annum in the period leading up to 2012” for the big four procurement companies. But does paying a price for government procurement that enables the provider to make a profit involve socialising the risks of private profit? Delivering goods or services to the public sector requires an investment of risk capital which is only made in the expectation of a return. The fact that this capital is risked can be seen from the share price performance of two procurement companies explicitly mentioned in the report. Over five years Capita’s share price has almost doubled but Serco’s has fallen by more than 75%. If the risks of investment are being socialised, they’re not being socialised very well. Remove that return and capital doesn’t get invested and the goods and services aren’t delivered. The report also asserts that “such transactions take place outside of the regular market, meaning that government often gets a worse deal.” Where poor value for money is obtained from procurement that point is well worth making. But the point is not well made through bland assertion – and confidence in the rigour of the treatment is diminished by the fact that the report ignores the legal requirement for government procurement contracts above a de minimis limit to be subject to open competition. Moving from the direct (£93bn) to the indirect (£180bn) measure of corporate welfare brings in measures such as working and child tax credits (because they enable workers to work for corporates), education and training (because they deliver to corporates a workforce) and the NHS (because good heath care contributes to high productivity). But are these costs to the public purse ones which “socialise the cost and risk of investment”? They are big numbers – respectively 13% of 25% of all public expenditure. But still they are said to be “conservative”. They exclude other forms of support identified in the welfare continuum – including legal and regulatory instruments, the system of money, the right to hire and fire and the right to trade – because the business benefits are simply too difficult to separate out. One could easily add law and order – which allows business to operate – and defence which protects it from confiscation by unfriendly powers. Indeed, it is tempting to ask whether there is any element of Government expenditure that does not deliver benefit to corporates; is the entire of state spending indirect corporate welfare? Without a clear distinction between that which is, and that which is not, corporate welfare are we left with any more than the idea that corporates cannot function without the state? Indeed, is it “corporate” the paper means or “business”? And why characterise a relationship where corporates are used to achieve Government policy as “welfare”? Don’t ponder that last question too long. By equating Government policy which benefits corporates to welfare payments made to individuals; by contending that “conservatively” 25% of all public expenditure delivers “unrequited” benefits to corporates; by suggesting that public policy purposes are advanced modestly if at all through that expenditure, the report seeks to steady and advance the narrative of corporate capture of the public sphere. It does. As bank shareholders agitate at the consequences – in particular, its impact on banking profitability – of implementing the lessons learned from the credit crunch, and as Government’s inclination to resist diminishes, what will society at large be left with? Little more, perhaps, than higher public indebtedness with its sequelae of austerity and a heightened public interest in the nature of the relationship between business and government. How that relationship should function poses questions for all governments, including on the centre-right. But for many on the left it has become the defining political issue of our day. No one could argue against proper scrutiny of individual policy decisions that deliver from public funds direct or indirect benefits to business. Nor would many contend that Government’s modes of engagement with business are perfectly delivered. But lump together tendentious assertions of value, couch the sum in the language of unrequited welfare, ascribe the result to corporate capture and you do no more than fuel a prejudice searching for a justification. My particular concern is this: that prejudice is hugely damaging to a centre-left embarked on an existential struggle to restore public confidence in its ability to deliver an environment in which responsible capitalism can flourish. It drags the left to a fairytale land of Government in crippled obeisance to mendacious business. Fairytale, and unelectable. Both Corbyn and Kendall – the former explicitly; the latter through the language of “£100 billion of reliefs” – have sought to mine this promising vein to pay, respectively, for greater spending and the austerian’s equivalent: closing the deficit. Unlock these riches and we need not engage with difficult decisions. By Nature’s power and human intellect. But like that other alluring promise, the £120bn Tax Gap, the corporate welfare gold can only plausibly be spent on policy objectives if the means of extracting it can plausibly be identified. What particular tax reliefs will be cut – and what will the savings be? What precisely is Government getting wrong in its procurement decisions? Turn your eyes from these questions and you might blind yourself – but you won’t fool a sceptical electorate. ← End of the road for “parasite” Member States? I agree with you that a rifle is invariably better than a shotgun for a topic such as this. One area which may more properly be described as ‘corporate welfare’ is where the profit taxed upon the payer of an expense is reduced by much more than the profit taxed on the recipient; especially where both companies are in a group or otherwise under common control. This used to be referred to as ‘imperfect symmetry’ but I imagine that other terms are now used. I emphasise that, as you would expect, I would funnel the additional tax collected back in full to business in the form of lower tax rates such as employers’ national insurance, business rates and corporation tax. I am just so amazed this nonsense gets published and picked up by people who ought to know better. I’d have thought a definition of corporate welfare would have something to do with state actions that allow firms to make excess profits, or rents. Hard to define in practice, but in principle what the essence of it is. For example, if you want to bus company to operate services in rural areas that would otherwise be loss-making then covering those loses should not be thought of as welfare, but doing so in a way that allows them to make fat profits from it should be. It’s so exasperating that The Guardian, a paper supposedly written by smart people for smart people, does not employ anybody capable for spotting this idiocy before it hits the press. It’s interesting also to see where the line of argument would take you. The suggestion seems to be that as corporates receive such a lot of welfare, they should pay more tax. But if that additional tax is used to invest in infrastructure, for example, then the £93bn and the £180bn would increase. Logically then, if £93bn and £180bn justified increased corporate tax, then higher numbers in later years would justify further increases – and the whole thing would spiral upwards. An argument which gets into a vicious circle like that should always be treated a little cautiously. If not explicitly advanced the narrative seems to make claims of public good and private bad. If we were to invert the arguments (as do many on the right) we would hear that the taxes and duties upon which the State relies stem from the actions of the private sector. This may be a caricature but it would perhaps direct us back to that soggy British middle ground of a mixed economy, a tax funded Welfare State and NHS, redistribution and so on. It may not be as attractive as single theme world visions,but it’s where poliitcs really impacts and where the UK left and left leaning parties seem in disarray.